The Service Bus Listener activity provides a powerful messaging mechanism to integrate your workflow with other applications or services. This activity integrates with Microsoft Azure Service Bus, which is a cloud-based messaging service used to connect and send information between applications, services and devices. Use the Service Bus Listener activity to listen to messages and start or resume a workflow when data is transferred between different applications and services. Messages are transferred in a binary format that can contain JSON, XML, or plain text. The received data is saved in the workflow UACT table, in the Message Body column. You can set up workflow expressions to extract the message data. Before you add a Service Bus Listener activity to your workflow, you need to set up the service bus entity in Microsoft Azure. You can use the Service Bus Listener activity to start or resume several types of processes. For example, you can set up a service bus activity for an inter-bank transfer that requires customer’s approval based on specific conditions. The service bus sends a message to a queue and Cora SeQuence creates a process for the bank’s representative to receive the customer’s approval in writing. For topics, you need to set up a subscription. To add a Service Bus Listener activity to your workflow, in the AppStudio, select Integration>Service Bus Listener. Double click Service Bus Listener. On the Service Bus Listener Activity Properties screen, give a significant name to the activity, and then click Next. Name: Enter a name to the actual job performed by the Service Bus Listener activity. Select a server on which to run the job. Leave the field blank, if you want the system to allocate a server to run the job. Job is enabled: Select this option only after you complete the workflow, or if you want to run the job for testing purposes. Job supports redundancy: option is selected by default. Clear the checkbox if you do not want to enable redundancy. For more details on job redundancy settings, see this article. Entity Path: Enter the name of the queue or topic, depending on what you configured for the service bus. Queue Client: Select this option if the service bus uses a queue to transfer messages. Subscription Client: Select this option, if the service bus uses a topic to transfer messages. Subscription Name: Enter the name of the subscription that was set up for this topic. Test Connection: Verifies that the parameters you entered are valid, and Cora SeQuence can connect with the service bus. Require Acknowledgement: If you select this option, the message is kept in the queue until Cora SeQuence acknowledges that it successfully started or resumed the process. Only then the message is deleted. Retry Interval: Set the time (seconds) for the job to retry after failure. Max Retry Count: The maximum number of times the system tries to rerun the job. Setting up the Service Bus Listener activity to resume a workflow requires additional configuration and integration with an external service. After you create the Service Bus Listener activity, it waits for a message to arrive to a queue or topic configured for it. If the Properties property of the message contains theJesActivityInstanceId key with a value that matches an instance of a Service Bus Listener activity, the Job Execution Service picks up the message and resumes the execution of the workflow. Place the Service Bus Listener activity anywhere in the workflow, except right after Start. Get the Service Bus Listener activity instance ID using an expression. Send the Service Bus Listener activity instance ID and its value as a property named JesActivityInstanceId to the queue or topic configured in the activity. If the Service Bus Listener activity was already executed, depending on permissions, the activity may be executed again. Cora SeQuence only checks for duplicate messages in the same workflow. You cannot have two workflows with the same Service Bus Listener activity job definition. 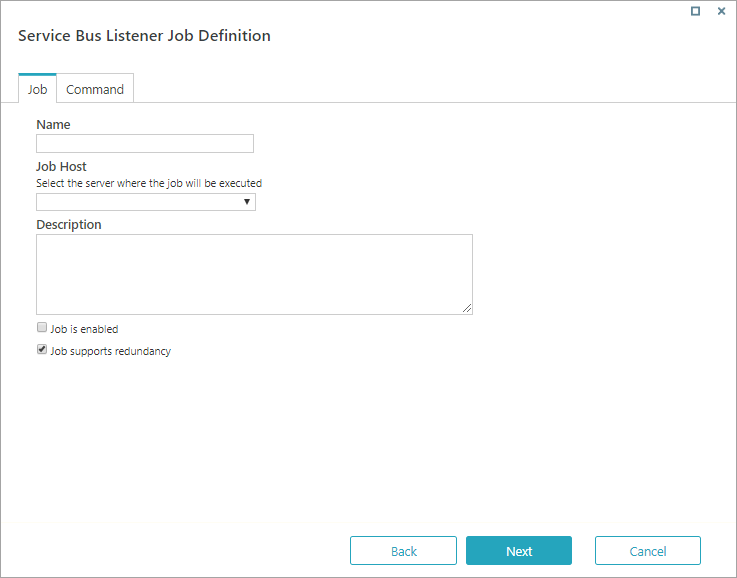 If you copy a workflow, you need to redefine the Service Bus Listener job settings. Cora SeQuence does not support sessions. When you copy or create a new version of a workflow that contains the Service Bus Listener activity, you need to delete the Service Bus Listener activity in the new workflow, and then set it up again.